Sigmund Freud once was quoted as saying “Sometimes a cigar is just a cigar.” After inventing the idea of phallic symbols, and knowing how much he loved to smoke cigars, there are people who would have disagreed with Freud’s veiled attempt to shield the psychological dimensions of his own smoking habit from public scrutiny. Cigarettes are no different in their role as phallic symbols. First, I have got to tell you about Tex Williams. You are looking at the album cover for the biggest hit of his career. “Smoke, Smoke, Smoke (that Cigarette) was a #1 hit on billboard for six weeks in 1947, and was the first million-seller for Capitol Records. Despite the uber-cheesy look of the album cover, it seems that the song is actually an anti-smoking song, but with a certain postwar morbid sense of humor. Scroll down for the You-Tube video (black-and-white, of course). 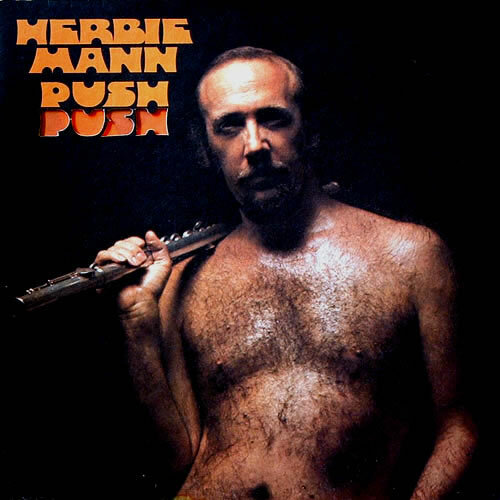 Pioneer flautist Herbie Mann is a big name in Jazz circles. He helped get Chick Corea’s career started by having him play with a few of his ensembles. He has enjoyed quite a range of crossover success, with 25 of his jazz albums entering the top 200 pop charts. The album cover suggests that he has a talent with more than one kind of flute. … Just ask Herbie’s taxi driver. He saw everything. He should have first suspected something was up when he picked up Herbie and his GF in a swanky bar in Lower Manhattan, and then they asked to be driven to an obscure Pizza Parlour in Hempstead (Long Island), taking only the side streets. After about an hour he had to ask Herbie and his lady friend to tone it down a bit because he had to concentrate on driving the car. However it must be said that talent with playing the flute is really a talent the partner has, and not of the possessor of such a flute. Jerry Williams, Jr., known to his adoring fans as “Swamp Dogg”, is a soul musician, and has been putting out such music since the 1970s. He has been making records under various monacres since 1954, and has his present name since the 1970s. He continues to make records to this date. “Rat On!” is Mr. Dogg’s second LP, released in 1971. Swamp Dogg has commented on the relatively recent trend by rap singers to go for names like “Snoop Doggy Dogg”, “The Doggs”, and “The Dogg Pound”. He seems unsure that he had any influence on those musicians.